Nether Alderley Mill is currently closed to the public, but that’s because we’re working hard to make essential repairs to its roof, timber structure and mill mechanism. For a more general background to the project, check out our ‘What’s going on?’ page, and for a little bit about the history of the mill take a look at our page on ‘The Mill in its heyday’. The Nether Alderley Mill website can also be found here. This morning we went over to Nether Alderley to carry out our final checks before we re-open the doors of Nether Alderley Mill. After four years of restoration the Mill will open on 2nd March and will close on 3rd November. We’d be delighted to see you on Thursday, Saturday and Sunday afternoons from 1:00 – 4:30 p.m. Visits to Nether Alderley Mill will be by guided tour only and these will be available on a timed basis when you arrive for your visit. We hope you won’t mind a short wait but as space is limited in the mill, and we want to make sure visitors have the best visit possible, we think it’s worth it to be with a small group with one of our volunteer tour guides. The layout of the mill, its charm and the wealth of detail still in existence has enthralled all those who have worked on reopening the mill. We hope you too will be charmed by the evocative sights and sounds of this special place. We’re feeling particularly festive here at the Mill today after researching the history of Nether Alderley Village and the tradition of the Mummers. The Mummers are traditional sketches performed at Christmas or New Year by a troupe of actors called mummers. Characters in the play are: an Enterer-in; St. George; Black Prince; Col. Slasher; Beelzebub; The Doctor; The Groom and The Horse. The key character is the comical doctor who was needed to revive the loser of a sword fight between a hero and an adversary. The heroes would vary regionally, for example in the Cotswolds it was Robin Hood rather than St. George. In Nether Alderley the Mummers were performed by the Barber family at the annual Christmas party hosted by Lord Stanley held at Alderley Park. The play dates back to at least the Elizabethan period when a performance of the Mummers followed by Morris dancing was an important part of the celebrations for the Twelve Days of Christmas, organised by a member of the community acting as the ‘Lord of Misrule’. Other Elizabethan traditions included burning a Yule log from Christmas Eve for the whole Twelve Days of Christmas. The Yule log is something we are still familiar with today although perhaps more in the chocolate cake variety! Christmas dinner was a luxurious feast for the rich with a goose, turkey or a dish called ‘brawn with mustard’ made from force fed boar meat. To accompany the meat there would be Christmas pudding, sweet mincemeat, tarts, syllabub and the new vegetable of the period – the Brussels sprout. For those who could afford it there would also be a banqueting course of sweet and colourful delicacies to visually delight guests. Almond paste and sugar paste would be moulded to make all sorts of things such as eggs, walnuts and ‘collops’ (rashers) of bacon! This would be washed down with mulled wine and ‘lambswool’ – a drink made from mixing hot cider, sherry, apples and spices heated until it exploded and formed a white ‘wooly’ head. It really was the season to eat, drink and be merry! We extend these warm wishes to you and hope you have a very Merry Christmas! Nether Alderley Mill is alive once more! Well since our last post, although we have been quiet on here, we have been extremely busy finishing the building work. As you can see from the outside the mill, the building work is complete and the only noticeable addition is the new access ramps. Inside, the mill is alive once more, with just the few inevitable snags to sort out. The Millwrights and our engineers are still tweaking the machinery a little and more work needs to be done to the Upper wheel in January. Apart from this the mill has been running quite beautifully and producing flour. 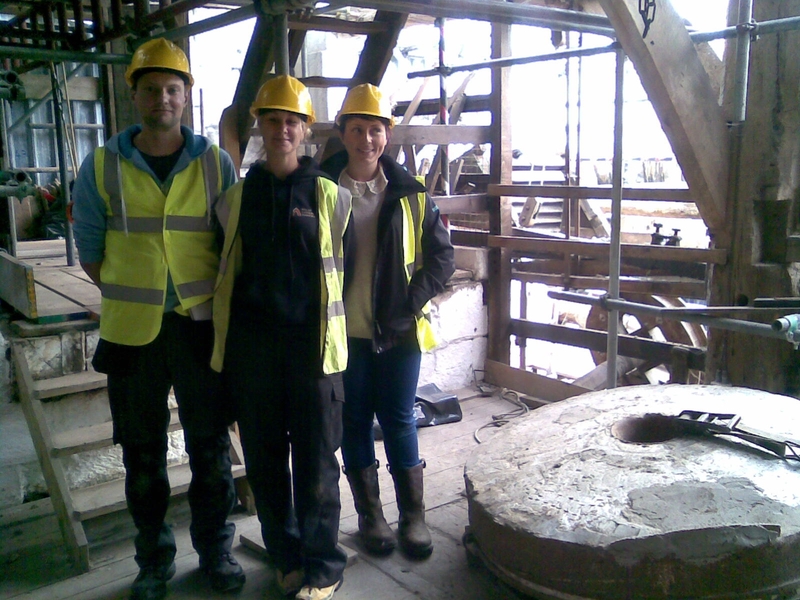 Our volunteer Millers have been on a specialist training course and are now learning to operate the machinery in preparation for the opening in Spring 2013 (keep checking back for an exact date!). Part of this training will take place in December, so watch this space for a separate blog post on what they have learnt. To open on time, the team have been handed a large to-do list and this is what we will be concentrating on until we open. The list ranges from the not so glamorous jobs of purchasing a till, till rolls and a vacuum cleaner, thermal underwear for our staff (very important if anyone has visited the mill in autumn and spring!) to working on fancy design packages for interpretation, publicity paraphernalia and conducting health and safety assessments. One thing that has become clear is that we won’t be able to sell flour just yet as this process will take longer than anticipated. It does remain a future aspiration however and is something we very much want to implement and will be working towards after reopening. We have also had a new addition to our team – a new project assistant Nicola Campbell. Nicola has replaced Catherine Farfan who has moved full time to assist with a new project at Quarry Bank Mill, more about our sister property can be found on here (www.quarrybankmill.org.uk). One of Nicola’s main responsibilities from now until March will be recruiting and training volunteer guides. If you are interested in becoming a guide, please email Nicola (nicola.campbell@nationaltrust.org.uk) to register your interest and she will be able to give you more details. Last week, the scaffolding came down from Nether Alderley Mill, so if any of you have been driving through Nether Alderley along Congleton Road recently, you’ll be able to see its long, sweeping roof once more! Although, unless you know the work’s been going on, you possibly wouldn’t think that much had changed from outside. This is a credit to the hard work of all the experts we’ve had on site over the past 6 months, working hard to make sure we can reopen Nether Alderley Mill while still making sure we don’t lose any of the little idiosyncracies that make it such a special place to be! If you happen to be walking past the mill* and take a look up at the mill roof, it might be difficult to see where exactly the changes have happened. Most obviously you’d be able to see that, in places, the wood around the mill’s windows has been replaced and they’ve all been re-leaded. But it’ll take closer inspection to see where the rest of the work has been going on. This is because the majority of the structural work at Nether Alderley Mill has been happening under the roof tiles. After the roof was removed to take a closer look at these issues, Lucy from our architects (Wiles & Maguire) and Andy from our conservation contractors (Lambert & Walker) spent two long days painstakingly going through every single beam on the vast roof, working out where repairs were needed and, if necessary, replacements. 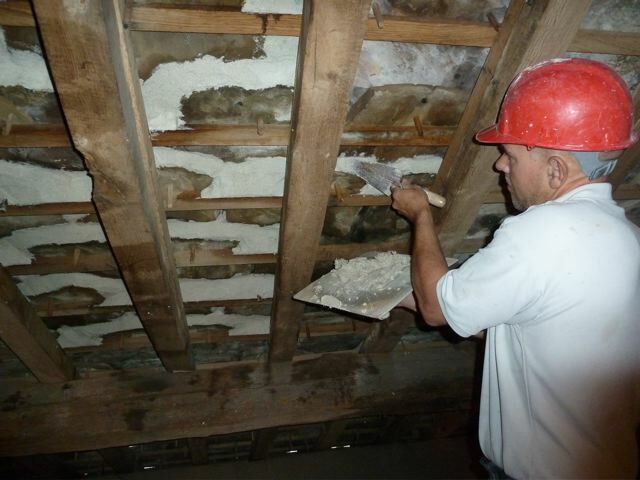 Once we had a clearer understanding of the work that needed to happen, a father-and-son team of joiners who specialise in carpentry repairs and traditional joinery, started on site, repairing, replacing, strengthening and splicing timbers. When they were done, the roofers could begin replacing the roof slates. Carefully numbering the slates as they came off the roof really paid off: the roofers were able to replace the vast majority of the slates exactly where they used to be, or, in the rare instance that this couldn’t be done because the slate was damaged or unsuitable, substitute them with a carefully sourced reclaimed stone slates. Each tile had to have a new oak peg. Each peg has been hand-whittled by the roofers so that it sits in the slate neatly, allowing each slab to hang securely from the battens. We’ve been reliably informed that the pegs would be taken home each night to be shaped in front of Coronation Street – true dedication! The inside of the mill will also be freshly lime-washed. And last but not least, work will be starting imminently on an access ramp into the mill, which will allow easier access into the ground-floor areas of the mill. And that’s not to mention all the other, behind-the-scenes preparation that needs to go on before the mill can welcome visitors again! We’ll continue to keep you updated as the work reaches its conclusion… In the meantime, let us know what you think in the comments below! * We wouldn’t recommend you stop in your car at the moment – there’s no space on our car park yet, and it’s such a busy road…! So, first things first, I would like to apologise for being so quiet on the blog recently. Although it’s no real excuse, it’s precisely because it’s not been quiet here that I haven’t had a chance to keep everyone updated. On Tuesday morning we were paid a visit by some local press, including Granada Reports (ITV), who brought with them Mr. Robert Taylor. Yes, that’s the Mr. Robert Taylor who had left his mark on Nether Alderley Mill in 1960, aged just 17 – the good people at Granada, with the aid of an article in the Wilmslow Express, had tracked him down! He didn’t need the graffiti for long though – he got married only two years later and has been happily married for the last 49 years! Granada also interviewed Amanda, our Heritage Manager, about the Trust’s plans for the mill, and Andrew Wiles, the director of Wiles Maguire (the architects working on the mill). The video can be seen in full at the Granada Reports website, here. A visit from some fine fellows! 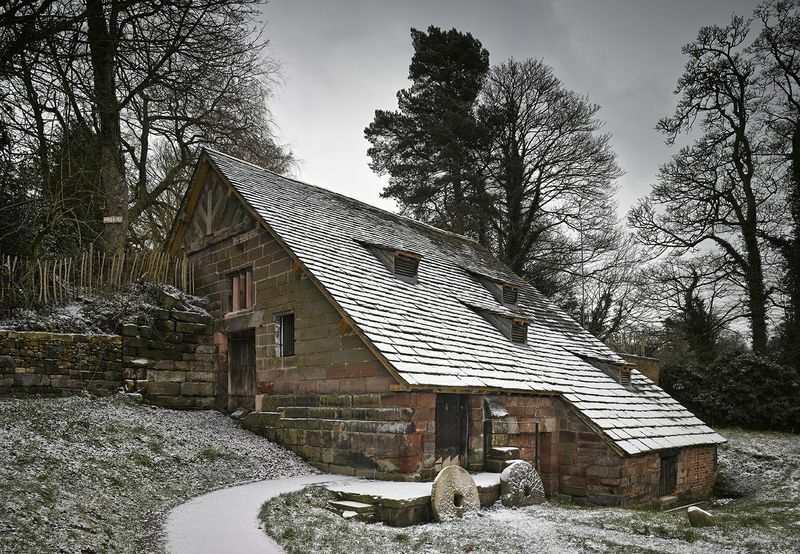 On Thursday 12th and Friday 13th April, we hosted three Fellows from the Society for the Protection of Ancient Buildings (SPAB) at Nether Alderley Mill. 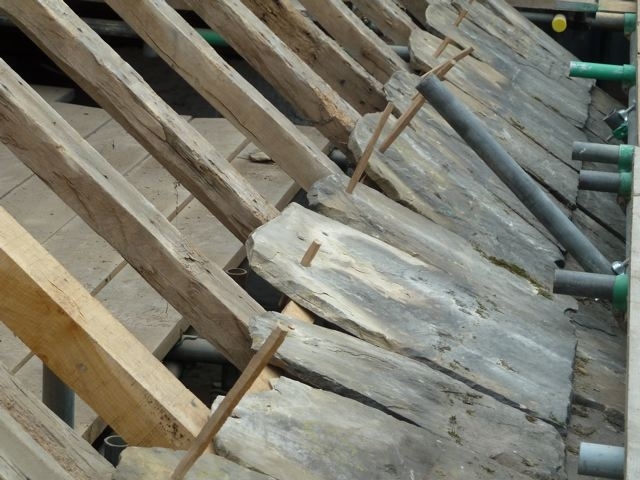 The SPAB fellows are a group of young craftsmen and women working in heritage professions, and the SPAB fellowship gives them the opportunity to visit a wide range of heritage and conservation projects as part of a funded six-month training programme. “There’s so much to take in here, especially as none of us have worked in a historic mill before and the work seems to be very challenging. There is so much value in getting buildings such as Nether Alderley Mill up and running as functioning buildings rather than just as static monuments. It will really bring the building to life for visitors to see flour going through the stones again. 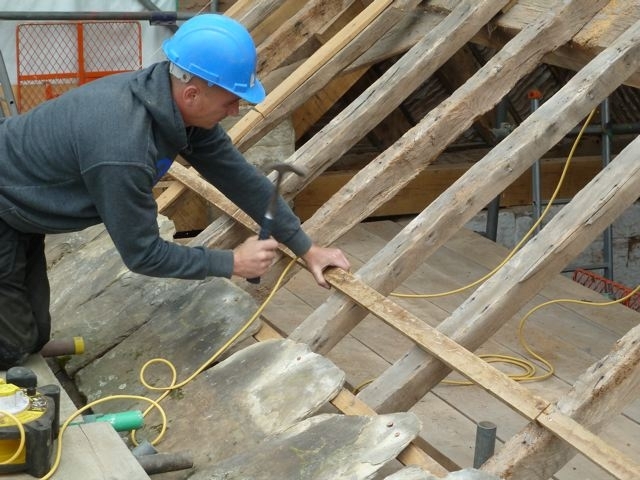 You can find more information about the SPAB Fellows on the SPAB website here or on their blog here.